This galvanized pole line hardware was designed to install dead-ends and guys on utility poles already having existing risers that prevent standard attachment practices. The guying system consists of two (2) double-eye connectors and a pair of equalizing hitches. This system will work on any strand from 1/4 in. (6 mm) to 3/8 in. (10 mm) in diameter under heavy storm-loading conditions. 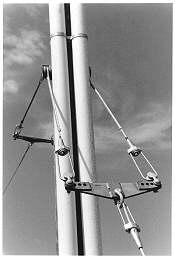 You use the connectors to attach the strand and guy leads to opposite sides of the pole; each of the two (2) three-point hitches has a thimble-eye clevis to divide the strand-guy lead into parallel leads, giving you the necessary riser clearance.